He does a survey of three provinces, on the outskirts of Mongol Iran - to study their interaction with that centre: Kirman, Shiraz, Herat. Self-governing, independent, in collaboration or cooperation. These are each fascinating tales, too, with personalities - such as the queen of Kirman - worth the acquaintance. 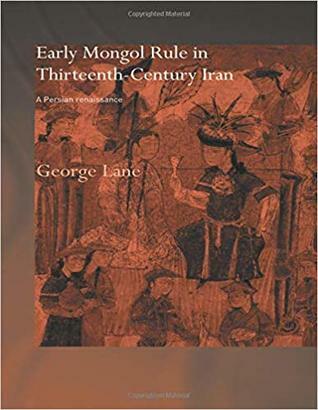 Next there's a chapter on the Juvainis, for a close-up look at Iranians in Mongol government service - attitudes, questions of loyalty and commitment. One of the Juvainis wrote Genghis Khan: The History Of The World Conqueror. After that, a chapter on an intellectual giant of the times, Khwaja Nasir al-Din al-Tusi, and his dealings with the government; then one on 'Poets and Sufis' wherein we meet Rumi, who I believe is in contention for America's most popular poet. I'm tempted to say it's a holistic study, except I don't use that word. You can't afford to miss it, whether you wish to know about Mongol Iran or think you do. Sign into Goodreads to see if any of your friends have read Early Mongol Rule in Thirteenth-Century Iran.